Raja Sen says that Bbuddah Hoga Tera Baap is not a particularly well-crafted film but none of that matters as Amitabh Bachchan [ Images ] makes it work. Post YOUR reviews here! 'Amitabh Bachchan is a superhero.' I used to believe that, growing up. Comicbooks called Supremo said he was, and I gladly bought into the idea of this man who acted in movies by day and went off to rescue kidnapped younglings by night. It only worked because it was Bachchan, of course. When we watched Hindi movies on video cassettes, Dad would fast-forward the songs while Mom would avenge herself by skipping through the protracted fight sequences. Except when it was Amitabh, because watching that man kick people is an electrifying experience. Filmmakers agreed, repeating the kick thrice, in rapid succession. He'd punch an extra in the gut, and because of how intensely he contorted his face into a focussed grimace, the dhishoom would resonate into reality. But you know all that already. When we first see Amitabh Bachchan in Bbuddah Hoga Tera Baap, he's leaning on the rails of an escalator. There's a swagger-like quality to the way he slouches, like a casually lazy leopard in no rush to prove himself, or like Dev Anand [ Images ] a couple of decades ago: an old legend somehow carrying off a canary yellow scarf. Oops. That O-word. Bachchan's character despises being called old with Obelix-ian indignation, spurring him to go ahead and roar. And nobody, but nobody, roars like him. Puri Jagannath's film is not a particularly well-crafted one. The story is threadbare, the scenes disjointed and abrupt, and poor Raveena Tandon [ Images ] is made to contort her face for almost a full minute. None of that matters. This isn't a masala film, it's a full-blown exploitation flick, and all that makes it work is the man under the spotlight. The extras can't stop smiling, almost as if Bachchan told them a knock-knock joke before the cameras started rolling, and they're all just basking in the grand silliness of this film. As are we. Plot? Please. Amitabh Bachchan is a retired gangster freshly back in Mumbai [ Images ], and his triggerfingers are itchy. That's all that counts. There's a cop, an ex-wife, a groupie, assorted mafioso, the cop's girl, a nosy landlady, a bizarrely brutal father, yadda yadda yadda. It's all utterly unnecessary, except to give the viewer a mild respite from Bachchan-gazing. I'm not a subscriber to that larger-than-life school of cinema bequeathed to us from the South. Ghajini [ Images ], Wanted, Dabanng, Ready. All of it's been mostly painful, but they have centered around leading men thoroughly enjoying themselves, and people paying to watch that. Aamir Khan [ Images ] kicking a door down, Salman Khan [ Images ] with a moustache. All of that fades in comparison to Bachchan doing a greatest-hits medley in this film: a fight here, a wink there, a little bit of storytelling in that voice, and even the twist. I stand converted. He's the man, and he's plain Rajniffic. Sonu Sood [ Images ], obviously cast because of his uncanny resemblance to the young Amitabh, is a solid actor but here, even playing a tough cop, is made to sigh and sob too much. Clearly there was only room for one alpha male in this corral. Prakash Raj [ Images ] is the primary baddie, while the ever-amusing Makarand Deshpande finds himself a lovely existential moment at the film's climax. There are a couple of young girls, but this film isn't about the young as much as it is about the timeless: Raveena Tandon still looks like a million bucks and is quite adorable as a starry-eyed Bachchanista, and the immaculate Hema Malini [ Images ] even makes this film's name sound beautiful. There are a few beautiful Amit-Hema moments, highlighted with one where he nonchalantly discusses their backstory: about how they first saw each other at a traffic light, with him in a police jeep and her in an autorickshaw, her hands heavy with grocery bags and his bound in cuffs. A formerly married couple, they bump into each other, he upsets her, and she walks away sobbing, but turns around. Shamelessly the Naseeb title track plays in the background, and we cheer, for old screen romances are worth rooting for. The steel cage may have been replaced by a coffee shop at a mall, but the song remains the same. As does the dude. Daddy clearly knows best, and Bachchan -- who even surreally lipsyncs to his son rapping about chicks -- is in such fine fettle that it's hard to not look past the circumstances and fall for his grin. Angelina Jolie [ Images ] might have shown us how to bend a bullet in Wanted, but when the Big B [ Images ] does it, you want to wolf-whistle. His clothes are screamingly loud but very hip. Asked if he'd like tea or coffee, Bachchan sneers. "Tea and coffee don't go well with soda," he explains. Ha. I'm going to go out on a limb and declare full-blown fandom for this character, who well and truly deserves a franchise. He might be a complete throwback, but this is a Hero. Next time they might consider pausing before he enters the screen to write BAAP in massive letters, though. 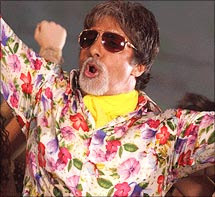 In the title song with that ridiculously groovy 'action-Jackson' loop, Bachchan sings about his past, saying he's split as many heads as he's broken hearts. It's a line worth dwelling on, considering he was the first icon to straddle all genres, from action to comedy to romantic drama, with unanimous success. It's been a staggering career, and the fact that he's nearly 70 and rocking a Harley Davidson is just awesome enough to make this film more than the guilty pleasure it is. Aviator sunglasses aren't the wisest thing to wear when shooting with a sniper rifle in the glaring sun. But who cares when they're that damned cool?